NEW YORK, Feb. 12, 2015 – ServiceChannel, the leading service automation platform for facilities managers and contractors, today introduced a number of major technology advancements to its industry-leading cloud-based software platform. The enhanced ServiceChannel portfolio is designed to deliver “more valuable properties” via innovative, automated, and operationally efficient ways to find, manage, analyze, and pay for services through a global network of external contractors. The company’s expanded product line offering enables customers to further optimize facilities management and service procurement processes and tailor them to their individual and unique requirements. Specifically, the company added four new products – Custom Analytics, Supply Manager, Site Audit Manager, and Payment Manager. ServiceChannel Service Automation: The core platform in the ServiceChannel suite automates key business and service processes such as sourcing of contractors, connecting locations with external service providers, managing invoices and payments, and providing visibility and data for improved performance, compliance, and risk management. ServiceChannel Service Automation is built on a fully redundant, highly secure, and multi-tenant cloud architecture based on Amazon Web Services. It integrates, via open APIs, with leading enterprise productivity and resource planning applications such as SAP, Oracle, Lawson, and Microsoft. The platform also integrates with many other supplier and service provider applications, including Accruent, Ecolab, Grainger, SimplexGrinnell, Trane, York, and many others. ServiceChannel Custom Analytics: Enabled through a strategic partnership with GoodData, a leader in business intelligence solutions, ServiceChannel Custom Analytics enables clients to modify the standard ServiceChannel analytics or build their own business intelligence platform tailored to their specific operational processes. 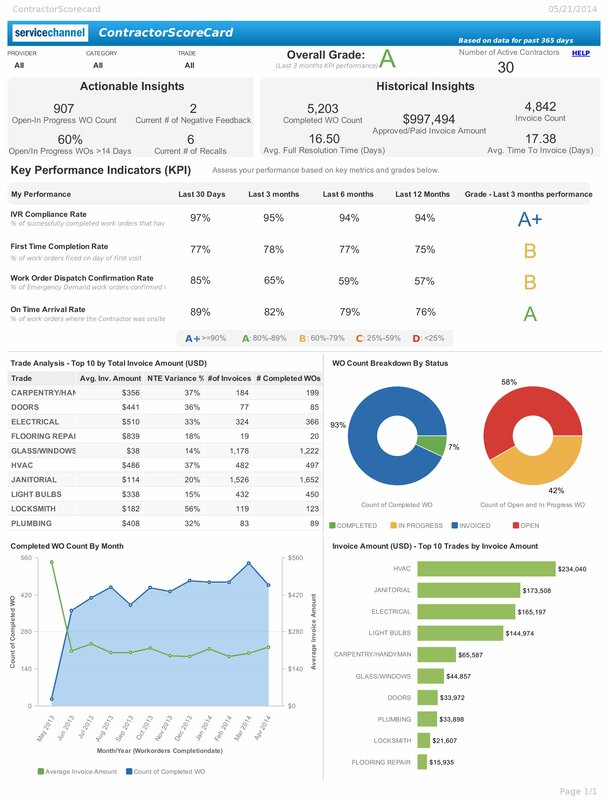 As part of the new analytics launch, ServiceChannel has published “8 Financial Reports Every Facilities Manager Needs (and Every CFO Loves)” for facilities, procurement, and financial managers. ServiceChannel Supply Manager: A self-service tool enabling facilities and procurement managers to customize an on-line catalog built with company-approved contracted materials, equipment, parts, supplies, and support services. Supply Manager streamlines and standardizes purchasing across every facility in an enterprise. This helps maintain brand consistency across all sites, optimizes cost and inventory control, while maintaining compliance and adherence to corporate purchasing policies. ServiceChannel Site Audit Manager: A new mobile application that enables fully configurable and comprehensive on-site audits of facilities using smart phones or tablets, providing a consistent and efficient way to help manage brand and customer experience. Site Audit Manager allows users to create work orders during a survey, and is fully integrated with the Service Automation platform and analytics offerings to help users make more informed, data-driven repair or replace decisions. ServiceChannel Payment Manager: Consolidates, processes, and pays invoices, and enables companies to automatically pay hundreds or thousands of contractors via a single wire to and through ServiceChannel’s secure cloud platform. Payment Manager ensures consistent and timely payment for services delivered, reduces the operational burden and costs for facilities managers and accounts payable teams, and improves consistency and satisfaction among suppliers and contractors. The ServiceChannel Service Automation platform and the four optional products are all available now to license on a per-location basis. For more information, including a live demo of these products, visit www.servicechannel.com. ServiceChannel was named a GAP Inc. Strategic Partner in 2013 and was awarded two Nike Vendor Excellence Awards in 2010 and 2012. ServiceChannel was also named the Vendor of the Year in 2011 by The Professional Retail Store Maintenance Association (PRSM).